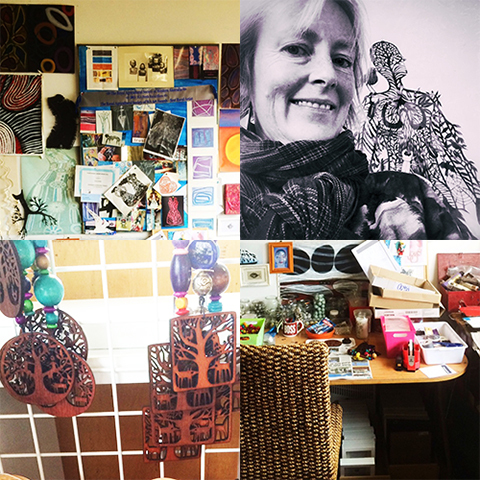 I am a regionally based artist/ designer located in the beautiful and historic town of Albany on the south coast of WA and live with my musician husband and 8 year old daughter. I work from a courtyard studio, which is at the rear of our house and which is filled with artwork, and beautiful things we have collected from our travels over the years. For over 25 years I have worked in the arts. As well as my studio work and having widely exhibited, I have also done public art projects, arts consultation, community arts, various residencies around the world, and curated exhibitions. My focus for the last five years has been “This Papercut Life”, a creative business that has increasingly- and creatively- grown and expanded. In this capacity I create a range of artworks, jewellery, clocks and home wares. My work is commissioned by both the corporate and private sectors and I stock 22 shops and galleries around Australia including Aspects of Kings Park in WA, Gunyulgup Galleries in Yallingup, WA, and Manyung Galleries in Victoria to name just a few. For the past 5 years I have worked predominantly with paper- using the medium of papercut, but this has evolved into other materials including wood and Perspex. It has evolved primarily from a 14-month period of my life some 5 years ago which I spent dealing with a serious illness- namely cancer. That life-changing experience refocused my outlook on life and subsequently my artwork. Returning to design basics assisted greatly in the process of expressing the challenges and lessons of my own journey and papercut was the perfect medium for doing this. I started by hand cutting all my pieces with a scalpel knife- but have since bought a lasercutter (and recently a second larger one) and this technology has enabled my design work to expand in both materials and applications. My inspiration comes from the appreciation of the little things in life- which are actually quite big- and include themes of family, community, and environment. There is a strong storytelling aspect to my designs and I have developed a playful and figurative style that both adults and children strongly relate to. They remind me of the drawings I did prolifically as a child. My creative process is a mixture of hand drawing and technology. I start with by drawing an image by hand which I then transfer into Photoshop, then vectorise in Illustrator, which then moves onto my laser computer which then tells the laser what the cut (or etch). A strong element of my design work are ‘family trees’- and I receive many commissions for personal trees that reflect families in all their diversity. When I was a teenager when I used to make elaborate mobiles from treasures I collected from our beautiful southern beaches, which I would sell at the local Art and Craft gallery. The fact I could make pocket money from doing what I enjoyed was a great revelation. I won a major Youth Art Award when I was 17, and then I graduated from Curtin University in Perth in the 1988 with a Degree in Fine Arts. My mother was also a well known WA artist so I grew up in an environment of making art, going to art exhibitions and parties, and surrounded by a passionate arts community. So I could never imagine doing anything else in life. Call it destiny. Perhaps luck. ‘This Papercut Life’ encompasses and helps me to remember the origin of this particular part of my creative journey- and it’s about life- living what you love. My online resources include my website, madeit site and facebook. These are great advertising and networking tools. My visual diaries are a great source of inspiration. As are my travels and the images and photos I return with. Qualities such as passion, perseverance, flexibility, openness, and a great attitude are all good to have in abundance. Believe in yourself and what you are doing. Don’t listen to negativity (unless its customer/ client feedback on something that’s not working properly). Be determined. Be authentic in your vision and your work. Find your voice. Find what is so essentially you and unique to you. And express it. Meaningfully. I am a big fan of Facebook Pages and instagram is also a growing audience for me. I don’t want to spread myself too thin by doing too many social media sites so I have chosen these as my focus. Be creative in the way you promote yourself. And just be you. Honest. Real. And don’t forget that newsletters may seem old hat but they are still a useful marketing tool for getting news out- as not everyone is on social media. Developing great relationships with your client base is also a must. Be friendly, helpful, accommodating and generous. Being a regional artist can be a challenge due to remoteness. Transport costs are high and you cant always attend events in the city. Thank goodness for the internet where I have been able to network and show my work. There have been no lessons that were so hard that they could not be overcome. I think an open attitude to challenges and problems is important- and to realize you can learn from it all. It’s all about perception. Hanging out with my family and travelling is my other big passion in life- so we regularly travel overseas. And quite often it’s SE Asia as it’s closer (and cheaper) for us here in WA to travel than to the east coast of Australia. I also love cooking (though after many years I am only just ‘getting’ it). Working our edible garden. Living fully. And having a good laugh. Music: We have a big record collection and it includes a diverse range of music: Ray Charles, Stevie Wonder, lots of blues, jazz, cool country, Midnight Oil, Nick Cave, Frank Sinatra, Pink Floyd, etc…. TV, Films, Books: As for TV, films and books - I don’t have time! Phone app: Facebook and Pages as they are great for business and keeping in touch with friends when I cant do it in the flesh. I also love Snapseed and Pixlromatic for my photo edits. I am lucky enough to be able to say that everyday is pretty much my perfect day. Albany is a place where you can have a great lifestyle. It’s beautiful. It has wonderful farmers markets. It’s a friendly place with a great community. My glass is full and even when its half full I always see the best in things so it creates a very happy way to live and I enjoy every moment really. I guess also after serious illness you develop a sense of peace, freedom and purpose that enables you to let go of things that you may have carried with you from the past. 3rdStoneDesigns - Very tough as there are so many great sellers but for me 3rd Stone Designs stand out among the crowd with a contemporary and unique edge.